Lilac Cottage is a stone built fisherman's cottage. It has recently been renovated whilst retaining a feel and welcome of a coastal cottage. It offers a comfortable base to explore the magnificent Cornish coastline. On entering Lilac Cottage you will find an open-plan kitchen/living area offering a fully fitted kitchen including integrated dishwasher, fridge & oven with grill, ceramic hob, extractor hood & microwave. Should you decide to cook, one can see across the Fowey estuary and the boats sailing on it! The living area (looking out towards the courtyard garden) has an eating area for 4 persons and a comfy seating area including sofa, chair & window seat. A traditional cast iron woodburning stove is the centrepiece for lighting during the cold winter months although a wall-mounted panel radiator is available for use. A small flat screen television & DVD player is also available. The first floor offers two bedrooms; one being a double room with built in wardrobe (overlooking the courtyard garden & village), the other offering a 3ft single bed with another 3ft pull-out adult bed under should it be required. This bed may be raised to the same level as the first. This room also has a built in wardrobe and overlooks the stunning Fowey estuary. Both bedrooms have space-saving stripped-pine sliding doors. The simple but contemporary renovated bathroom offers an electric shower, small sink, w.c. and electric towel rail. In addition, there is underfloor heating for those cold winter months (available between October-April). To the front of the property is a small contained paved outside area suitable for relaxing & 'al-fresco' dining. At the end of the paved area is an outbuilding which contains a washing machine and storage facilities. With this cottage also comes a dedicated parking space within the village (approximately 5-10 minutes walk - depending on how quickly one walks up the hill!) thereby avoiding any car parking charges. There is space outside the cottage to unload/load a vehicle prior to moving it to the parking space provided. We are now pleased to offer wifi at the cottage for all that can't be without their devices! The public house in the village also offers this free to its customers. Finally, for those who follow the 'Poldark' series, some of the key locations can be easily reached. Charlestown has been used for tall sail boat settings (45 minutes away), the National Trust's Levant Mine (which doubles as the rolling mill where Poldark's copper is processed) is 1.5 hours away and St Agnes famed for Poldark's horseback gallops is 1 hour away towards Cornwall's north coast. In addition, Bodmin Moor that is the setting for Poldark's home is 30 minutes away. Please note timings are approximate and are made by car. Hello, my name is Jackie and I am kept busy by working for an independent charity and assisting my husband in his business. I spend my spare time gardening, growing vegetables & being a taxi service to my two children! I like being outdoors and Cornwall gives me the opportunity to do just that. We are a family of four and have enjoyed many holidays in Cornwall. My children when young enjoyed 'crabbing' on jetties and digging in sand...now they are older they want to be more independent and Polruan offers all local facilities plus the inexpensive river taxi - they love it! We chose Lilac Cottage because we like the village life of Polruan with its thriving community and boat yard. 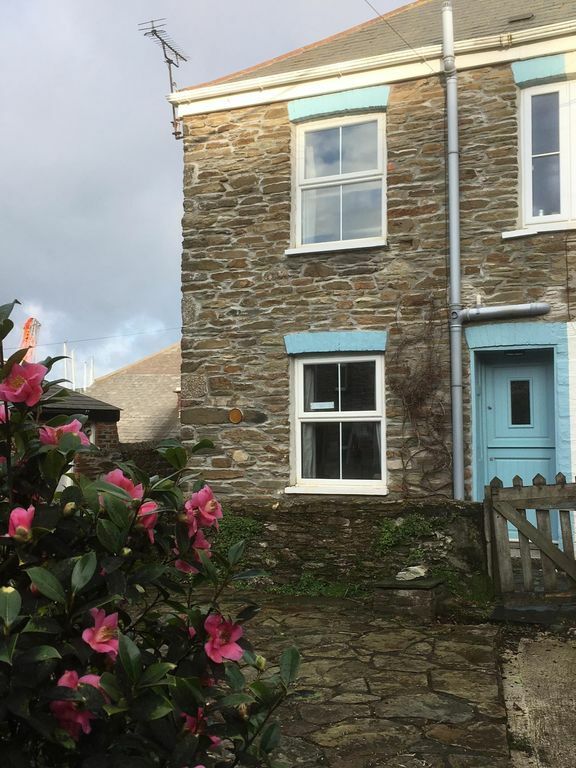 The busier town of Fowey is just across the estuary and we felt that a property in Polruan gives easy access to both. Polruan is very community based and there is always something going on. Lilac Cottage gives a great little base with a coastal feel and we have tried to keep our furnishings & decoration simple to reflect this. We hope that anyone who uses the cottage feels the same way. Although we recommend a car it is not essential. I have travelled to Cornwall by train, been picked up by taxi (£16 from Par, £30 from Bodmin) and taken to the cottage. Alternatively, take a taxi from Par station to the Polruan ferry dock in Fowey (£8) and take the ferry across (£1.80 pp) which is 2 minutes from the cottage. Once there, everything is available without going further afield. It's a great cottage to relax and unwind. Simple but contemporary bathroom containing a built in shower space with electric shower and glass bi-folding doors, small white enamel sink with storage underneath and white w.c. There is an electric towel rail and electric underfloor heating set under slate grey ceramic tiles for the winter months. Primary source of heating is the woodburner. However, there is an electric panel heater in the sitting area & an electric radiators in the bedrooms. The bathroom also has underfloor heating Oct-Apr. Bed linen & tea towels are provided. We do not supply towels. If this is required, please ask at time of booking - an additional charge will be made. A dedicated parking space for 1 vehicle is set further into the village for our guests to use. Unlimited and free Wi-fi for our guests. We do not supply logs but the local shop sells kindling, split logs & quick burn logs. The living area contains a sofa, beech-framed lounge chair, small upholstered chair, rug & selection of cushions. Guests do leave one or two dry goods left over from their stay. We do regularly check over the stock. We have a mountain of salt! We have tried to include everything someone might need so that as well as eating out guests can cook for themselves should they so wish. DVD player only (some DVD's suitable for children have been left at the cottage. The DVD player does not record. We do not have a pool table. However, the local Russell Inn pub a few steps from the house does! The garden is small and paved with a wall surrounding it. It has a variety of shrubs including fresh herbs. Tables and chairs are stored in the shed/outbuilding. A small paved area with access to garden furniture. Cornwall is known for its beautiful rocky coastlines. Lilac Cottage is in the heart of the village close to the waterside located at the bottom of the main (hill) road into the village. If you are interested in renting this cottage but would like to ask a few more questions, please contact me. We've just returned from two weeks in Lilac Cottage in Polruan, and loved staying here. The village is small but busy - with two great pubs, and numerous places to swim, or just contemplate life going on around you. The cottage is very comfortable and suitable for a family of four. Jackie, the owner, is very responsive when you have any problems. We used it as a base to visit the Minack Theatre, for surfing on Whitsand Bay, ferry to Fowey, and walks to Polkerris and Lantic Bay. So nice to return at the end of the day to really comfortable beds. Superfast wifi kept the teenagers sweet too.Things to be aware of - as others have said - it is a steep hill to get back up to car parking space. Also, noise from shipyard and vehicles turning round at the bottom of the hill - but all part of being in a village that seems like it has real life going on rather than just empty holiday homes. Wouldn't hesitate to recommend the cottage and Polruan. We had one of our happiest holidays ever here! The cottage is perfectly furnished, clean and in a fabulous location right by the harbour. We kept our inflatable dinghy in the front garden! and motored over to Fowey every day for shopping. Didn't use the car for six days, went on unbelievable cliff walks and came back so fit and healthy. The eastward cliff walk to Lantic Bay is strenuous but worth it when you get to the stunning beach ( take a lot of water). You can return via the road which is much easier. Westward we walked to Polperro and lunch @ Sam's on the beach. Allow at least 2 and a half hours to walk there but you won't regret it. In summary ; crabbing, sardines for lunch, beaches, cliff walks, fires in the evening, cider in the sunshine, happy children, messing about in boats equals a very happy holiday. Thank you so much for your full & positive review. It’s always good when a guest comments on the activities enjoyed. I can’t rake any credit for the wonderful weather but look forward to welcoming you back another time. We stayed at Lilac Cottage for the Christmas break. It was a wonderful place to escape from the general mayhem of the festive season. The cottage is small but perfectly formed. It was ideal for the three of us. Our eight year old son's one and only complaint was that the sound of the waves in the harbour kept him awake! Polruan is delightful. There is a regular ferry to Fowey (every day except Christmas Day). A brilliant local shop can be found a short way up the hill which sold pretty much everything! Speaking of the 'hill' this is what you need to negotiate in order to get to the allocated parking space - although we did only use the car once. And if you want to pay for parking there are spaces on the quay. Thank you Emma for your generous review. I’m so pleased you enjoyed your Christmas stay and look forward to welcoming you back again another time. We were delighted with the cottage, only two of us so the size of the cottage was no problem. Perfectly placed for the passenger ferry to Fowey running all day and a short drive to the car ferry. Easy access to glorious coastal path. Very steep hills on all walks and to the parking space, great if you like the exercise but wouldn't suit everyone. Amazing week....perfect cottage ...perfect location... we were lucky and had perfect wearher....we are walkers and clocked up about 40 miles and didn't use the car for 6 days !! Polruan is a gem on the English landscape.we are going to book for next year!!! Thank you for your review. I agree it is a walkers paradise (whatever the weather!) and we look forward to welcoming you back again next year. Lilac cottage is in the heart of the village and can be found at the end of the main street that descends steeply from the the top of the village to The Quayside. Polruan is a traditional Cornish village with its own working boatyard located on the bank of the Fowey Estuary opposite the the small town of Fowey with its boutique shops, restaurants and art galleries. Although a car is recommended, it is not essential as Polruan has all its own local amenities including a grocery store, bakery, cafe and Post Office with the added advantage of a welcoming pub offering great food to eat in or 'take-away'. The locals are very welcoming and there is always something to do or see. The village is a superb place to explore the wonderful and exhilarating rugged Cornish coast, whether it's sailing, walking, hiking or beach activities. There is also a small passenger ferry that runs at regular times from Polruan to Fowey (& return!) giving visitors the opportunity to explore the quality shops, art galleries, restaurants and bars. Additionally, a car ferry also operates a service to Fowey from nearby Boddinick. There are many walks nearby but for easy access direct from the cottage, the Cornwall Coast Path goes upwards from Polruan Quay through the village to the junction of St Saviour's Hill and then runs 7 miles eastward through National Trust protected coastline to the quaint village of Polperro. Alternatively, follow the Hall Walk (turning right outside of the cottage), right at the steps and then follow the pathway up and through the woods. From the small bridge at the head of the creek the path meanders through woodland to the memorial on Penleath Point and then on to Boddinick. Take the car ferry (open to foot passengers) across to Fowey. Distance: 4 miles. Return via the passenger ferry from Fowey to Polruan. There is also a regular bus service that picks up outside the cafe and runs to Polperro and Looe town. Should you decide to cancel your booking the owner retains the right to hold your deposit unless we are able to re-let the property for the same time-frame. A minimum booking payment of £200.00 applies to each booking.